artshow, originally uploaded by jahansell. The theme for today and tomorrow is going to be art (in this area, it could be the theme every day for a year, there are so many interesting artists and galleries around.) 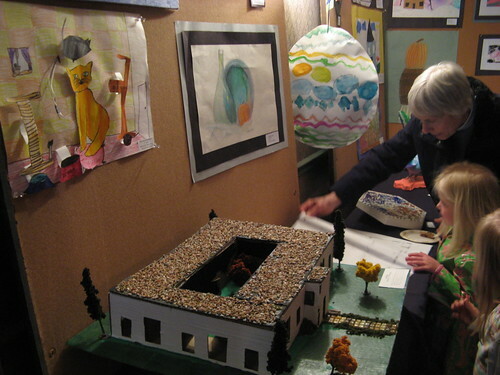 Region 1 (the schools of the six local towns) had a big art show - each school chose 1 or 2 pieces from each grade to be shown. My daughter's piece is on wall on the left (tiger - the project was to go from 2 dimensions to 3). The room at the Interlaken was packed with families come to admire the work of our community's children. Tomorrow: the work of a fascinating Millerton artist. I love seeing the viewers so involved with the work in front of them in your shot. Your daughter's piece is lovely to see and she really succeeded in going 3d! She must have been so pleased to have had her work chosen to represent her school. Congrats to her! My daughter and I (she's 19 now) went shopping at a huge center in Southern California in May where, as luck would have it, there was a giant art show of work from all the middle and high schools in the school districts in the county. We spent more time looking at the work than we did shopping, really. My daughter was going around docent-like saying, "Mom, did you notice how they did this and the materials. . ." I had grown up in that county and remembered the excitement my art class friends and teachers had about this show every year. Having one's work entered was such an honor. My daughter and I were amazed at the caliber of work displayed in all media. It was delightful to really look at things closely, and I wish we had had more time.